Revelations emerge that New Zealand has been spying on friendly neighbors. On Wednesday the New Zealand Herald working with the Intercept website revealed that New Zealand has been spying on many of its Pacific neighbors and passing vast troves of the collected information straight along to the United States’ National Security Agency. The allegations come from documents released by NSA whistleblower Edward Snowden in 2013. This is part of the government’s work with the “Five Eyes,” alliance, which also comprises the U.S., the United Kingdom, Australia and Canada. Working from its Waihopai base on New Zealand’s South Island, the Government Communications Security Bureau (GCSB) “hoovered up” large amounts of data from many Pacific nations and overseas French territories, all on friendly terms with New Zealand. The data was later shared through the XKEYSCORE NSA surveillance system and included chats, messages, emails and browsing sessions: all metadata, essentially. “The Waihopai base focuses on gathering data and communications from another source – vacuuming them up as they are being transmitted through the air between satellites,” says the Intercept. Officials, politicians, NGOs, and government agencies were some of those routinely monitored. That nations spy on one another might be cause for public diplomatic contretemps, but tacitly understood to occur. Similar revelations of Australia’s spying on Indonesia’s politicians and then President Susilo Bambang Yudhoyono (the revealed documents bear the motto in the bottom right corner “Reveal their secrets — protect our own”) caused huge friction between the two nations, whilst earlier reports of Chinese spying on Australia were dealt with more quietly. Why is New Zealand doing this? It seems to go against its recent UN Security Council election, which was all about the power of small nations when it campaigned with Pacific nations to earn their votes for its spot. It is, says the Herald, the “price of the club” and “ANZUS-era language” was noted. John Key, the prime minister, has referred to the “club” before when talking about effort to fight ISIS. 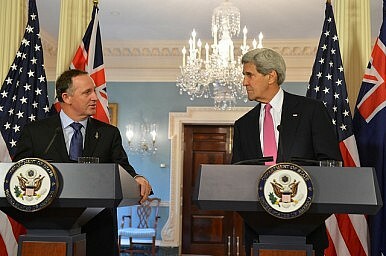 New Zealand recently committed troops, though only, promised the prime minister, in a training capacity. And why does the U.S. want New Zealand to do this? That base is well positioned to pick up satellite transmissions in the region. Some things, such as new undersea cables used by Samoa have cut back on the amount of data that can be gleaned. Surveillance, say critics, has risen dramatically during John Key’s tenure. The conservative Key last year was convincingly reelected. One of his more memorable challengers was Kim Dotcom, an internet billionaire, whose Internet Mana Party stood for net freedom, legalized marijuana, and better education. Mr Dotcom (his legal name) alleged mass surveillance during his campaign and vowed, should the Party win office, he would “shut one of those eyes,” in reference to the Five Eyes program. Not a Kiwi himself, he could not run for office even though he was the party’s founder and figurehead. Edward Snowden (whose documents reveal the scale of spying now) wrote last year, “If you live in New Zealand you are being watched.” Key denied that, but also admitted some collusion with the U.S. It is worth noting that Key is also the minister for National Security and Intelligence. When sort-of admitting some spying, Key has gone to the easiest existential threat: terrorism. However as has been pointed out, there seems to be more of an interest in political and economic intelligence than security.